I've been doing a bit of cleaning and here is a new page listing all the tutorials for FxFoto. You'll find everything from simple photo fixes to advance photo tweaking. 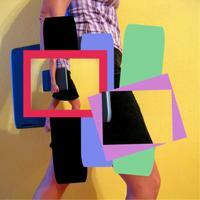 Plus lots of digital scrapbooking tutorials. Enjoy! I can't believe I forgot this tutorial! 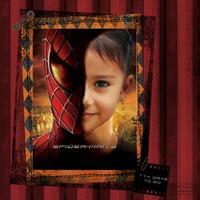 Look, Ma, I'm Spider Girl! Here's a little tutorial with all the information you need to create sketch templates than can be used with the Quick Layouts tool in FxFoto. The templates may be made with any photo editing software including FxFoto and you may find it very easy to just add an FxFoto friendly page to all your current sketch template kits. In case you haven't used the Quick Layouts tool in FxFoto, it lets users drag and drop papers into a sketch template. The papers and photos are automatically cropped and placed in the page so they are layered without having to learn about using layers. It makes it very easy to create a layout. Elements and embellishment may be added by simply clicking on them and then arranging them on the layout. Text is added in the usual FxFoto way - open a text box and then move it to where ever you want on the page. If you have never seen Quick Layouts in action, there is a video tutorial on the FxFoto website - Creating Layouts Part 3 - Sketch Templates. FxFoto uses color matching to drop papers so if a template has the same color in two different areas, the program will drop the same paper in both areas. 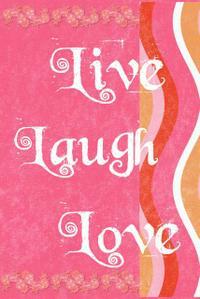 For example, in this template by Jen Caputo (available at The Digi Shoppe) dark gray is used in several areas. Design-wise you may well want the same paper in multiple ares of you template. But if not, the colors need to be different. You can go wild with the colors or make them more subtle - it's up to you. When I re-color templates, I tend to recolor every piece because I might want to make the different parts different colors. Okay - I will admit to being a bit of a scrapping control freak - lol! But that is just me and you know your customers better than I do. Here is the way I might recolor it. I could always drop the red paper into every other ray to make a repeating patter or I could make every ray a different piece of paper. On each paper and photo block there need to be distinct edges. Otherwise FxFoto can't see where the photo block or paper ends and will flood the adjacent areas with the photo or paper. And the edges should not be feathered or blurred. Let me show you what I mean. A picture being worth a thousand words and all! A big thank you to Cheryl McCain of The Scrapping Garden for graciously letting me use one of her templates as an example. Cheryl was one of the first designers to create templates specifically for use in FxFoto and this template is from her More Than One collection. Now here is what happened when I put a photo in the right block. It flooded into the background because there is no edge. It is kind of a cool effect but not if what you really want is two photos on a paper background. Then the photos end up as two photos, as they should. The users of FxFoto will really appreciate if if you don't have writing or journaling lines on the template. Otherwise they may have to first erase the text before using the template. A preview is a great place to note where a title and text should go. What works best in FxFoto is a TIFF file (sometimes called a TIF or TFF file) because repeated saving of the image will not degrade the quality. A PNG file will work too but if possible, it is best to avoid having your templates as JPEGs. What doesn't works is a PSD file since it is specific to Adobe products. You can find a brief discussion on file types and some of the pros and cons in What's the difference between JPG, GIF, PNG and BMP? What what about TIFF and RAW?" In the menu choose TIFF and then click Finish. In case you are wondering, CMYK TIFF refers to a special file type that is used in the publishing world, where CMYK determines the colors. I would not suggest using CMYK TIFF for a sketch template because it is very large. If you are a regular reader, you might remember my recent post Some Quick Pages. Well the tutorial I wrote for using FxFoto with ScrapQuick pages - Creating a ScrapQuickArt page with FxFoto Creative - is now up! Way to go Christine! Both of these are ScrapQuickArt pages - Beatitude by Amy Teets with the Sinead Turner as the page artist. I added the title ( Messy Stamped Alpha by Christine Smith ) and some journaling (Augie font). And that was it! How easy and gorgeous was that! I hope it get it up here too soon! It's going to be quite a busy week here but I will try to squeeze it in! I saw a recent tutorial about color isolation or as they called it, partial color, in About.Com's Graphics Newsletter so I got cracking....you can do this in FxFoto too. I bet you have seen those photos where everything is black and white except something colorful like a red rose or a blue balloon. It is really dramatic but actually very easy to do. As is true in most software, there are several ways to get this effect in FxFoto. Method 1 involves roping off the area you want to keep colored and turning everything else black & white using a filter. 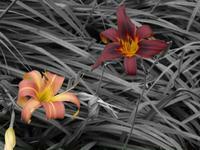 Method 2 uses two copies of the same photo - one is made B&W and placed on top of the colored photo. Then a transparency brush is used to make holes in the B&W copy to let the colors show from below. This is probably the easiest and fastest way to do partial color. It works best if the area of color you want to keep is all in one area and connected. The idea is that you are going to place a rope around the colored area and then turn everything outside the rope to black and white. 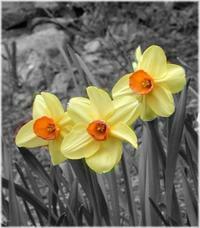 So the daffodil photo above is ideal since the flowers are all together and touching each other. To start we first need to draw a rope around the flowers. There are two ways to do that - hand draw or use an auto rope. Hand drawing can be done with either a mouse or a graphics tablet (like a Wacom) but you may find it easier to control the cursor with the pen of the tablet. Let's start with hand drawing. 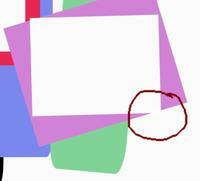 Now on the right side of the tab, click on Draw Loop (see the red arrow above). Using your mouse or gen. click and drag the cursor to form a line around the flowers, connecting it with the starting point. Since it is hard to have a steady hand, it is better to leave a bit of the background and adjust the rope afterward. Take a look at the screen shot below - the red arrows point to the dotted line I drew. Now let's adjust the rope so it goes along the edge of the flowers. to do this, click on the rope and draw a new line, connecting it back to the rope. The rope will now go along the new line. Zoom in so you can see the flower edge clearly and work in small step to bring the line in to the flower edge. In the screen shot below, the old rope is a black and white dotted line and the new one is a yellow dotted line. Once the line is set, you will apply the Black & White (Rope) filter effect. Click on the Outside Box ( see the red arrow below) so the effect will be applied outside of the rope. If you want the edge feathered, adjust the slider. Then click Apply and you are done. Don't forget to save it! This method uses the Auto Rope feature found in Cropping to apply the rope. You won't be cropping the photo - you will switch back to Filter Effect to apply the Black & White (Rope) effect. The auto rope works best if the colored areas are all the same color. First, click on Correct and then click on the Crop tab. Click on the Draw Loop button and you will see the Click Auto Loop slider turn on. This slider controls the color matching for the loop. The lower the number, the more precise the match will be. Since an object usually consists of several colors due to shading, the rope would only select the color that was clicked. Using a high number means that more of the object will in included. So for example, you can see I set the slider at 80 in the example below. If you find that only some areas of the object are being included, try increasing it. 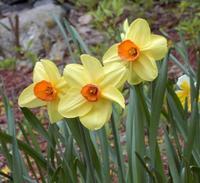 Now click on the yellow daffodil and the rope will be applied. You can see above that there are a couple of areas where the rope is not along the edge of the flower. You can adjust the rope by drawing a line to connect the areas better. Just follow the directions in Method 1A above for adjusting the rope. Once you have the rope adjust, click on Correct and then on the filter Effects tab. Click on the Choose effect drop box and from the drop menu, choose Black & White (Rope) . Make sure the box marked Outside is checked and then click on Apply. You may save the altered photo either as a new picture or replace the original one. click on Save and then click on Save Image As button. 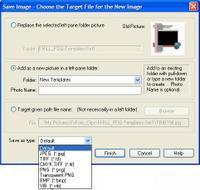 Decide on whether you want to replace of save a a new image and then choose folder and click Finish. FxFoto always saves the original - even when you decided to replace it! Want that original back? Open the altered photo in the right pane and right click it. Choose Restore Original. The idea behind this method is that we will be suing two copies of the same photo, one on tip of the other. First, we will turn the top one black and white. Then we will make some holes using the Transparency Brush so that the color from the bottom photo shows through. This is a great technique when you want several areas of color with a black and white background, like in the photo above. We need two copies of the same photo side by side in the right working pane so click on the photo to open in the main pane of FxFoto. Now click on the Collage Add button which is located just below the +/- zoom control on the right ( see the red arrow below). Now click on the photo again so you have two copies side by side in the right pane. 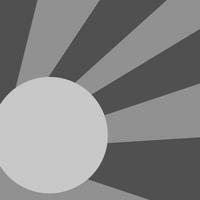 Now click on one photo to select it - this is the one we will make black and white. Click on Correct and choose Filter Effects. From the drop menu choose Black & White (Rope) and click Apply. Right click on the B&W photo and choose Show Image on Top. Now move it so it is over the colored photo. Now let's make some holes. Click on Correct and open the Color Brush tab. If you slide the Transparency slider all the way to the right, then brush can be used to make transparent areas in the photo. 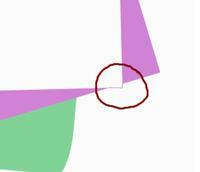 In the screen shot below I chose a circle brush with a width of 15 and no feathering. Below you can see the Color Brush tool bar set up as a transparent brush. It's really an amazing effect! Make sure the two photo are lined up exactly. Work in small areas by zooming in and using a small brush width. Adding a feathered edge makes the line where B&W meets the color a bit softer. Use the square brush for objects with straight edges. Don't You Just Love Templates? Three layouts all done with the same template from EZ Scraps by Angela Sharrow at ScrapDish. I love how easy they are to do and how each one feels different despite the common design. But to explain this to non-scrapbookers is the hardest thing! They have a hard time understanding what a sketch is, never-mind a sketch template. So to try to explain the difference between a sketch template and a pre-made quick page I decided to make several pages with the same template and to include the basic template in the explanation. I'm hoping that helps! And I ended up with some very cute pages in the deal. Credits: EZ Scraps template Vol 2 by Angela Sharrow at Scrap Dish for all three; stick photos from Stock Expert (because my DDs' baby photos are all pre-digital! ); the first and last use papers and elements from Shabby Baby by Sherrie Piegdon at Pixel Gypsy Designs; alpha is from A Baby Boy Story by Jen Reed at ScrapDish; the middle purple/pink LO used papers and elements from A Baby Girl Story by Jen Reed at ScrapDish; font is Augie. Got all those templates ready to go? 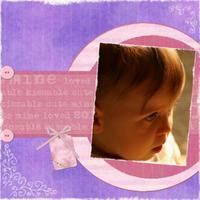 Here's part 2 of my tutorial on the Everyday Digital Scrapbooking Blog. This one focuses on using Quick Sketch tool on FxFoto so you can just drag and drop papes and they will automatically drop right in. What could be easier? Today on the Everyday Digital Scrapbooking Blog is my Tutorial on Preparing Sketch Templates for FxFoto. This is part 1 and I know I've written a couple of tutorials on this subject but this one is the best one to date! So hop on over there and take a look! In summary you can use any jpeg, tff or png sketch template in FxFoto. 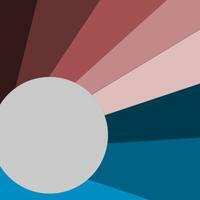 But you may need to recolor some gray areas and remove the text. And this tutorial will show you how. 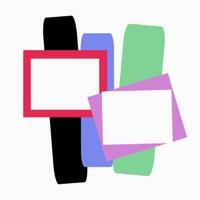 The Digi Shoppe - designer Rachel Giallongo has included colored jpegs for FxFoto users. If you are a designer and would like to include files that can be used in FxFoto, please contact me at seswhite@gmail.com and I will be happy to send you the specifics - it's not hard at all! 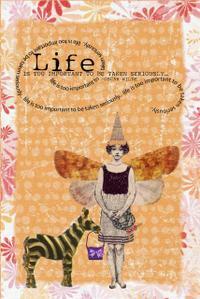 If you haven't noticed I am Miss May for the Everyday Digital Scrapbooking Blog. It's a title I find somewhat amusing since ...well...let's just say beauty pageants are not my thing. But it did let me write some new tutorials and today mine was featured - Teacher's Presents : Custom Postcards. And by the way, custom postcards would make a lovely Mother's Day gift in case you are still wondering what to get Mom. Just change the quotes a bit - how about gardening quotes for a mom who likes to garden along with flowery kit? Or maybe cooking or motherhood quotes. The possibilities are endless. And the best part is you can print them up at home, tie them with a pretty bow and avoid all the crowds at the mall on Saturday. Have fun creating your own postcards!